Webseology / SEO Tips / Link Building Strategies that Work! Link Building Strategies that Work! I know lately we have been embedding a lot of videos from Moz (formally SEOMoz), mainly on our sister blog, www.webseology.wordpress.com. Why? Because their information is always worth sharing. As an authority in the SEO industry, or should I say, inbound marketing, I try to read or watch a Moz piece on a daily basis – over my morning coffee. I learn something new or am reminded of something old almost every times. Here is an excellent video on link building strategies that work. I completely agree Cyrus Shepard in this video, and it’s how we at WebSEOlogy build links for our customers. Like it or not, Google is making us work hard for our backlinks. No more link farms, link wheels or automated link building strategies (keyword – automated) – sorry black hatters. Implementing proper link building strategies takes us back to the basics: HARD WORK and building relationships. We don’t have to like it, but we can certainly respect it; and in the long run our search engines will be a much better place. Watch this video by @MOZ to learn link building strategies to live by. 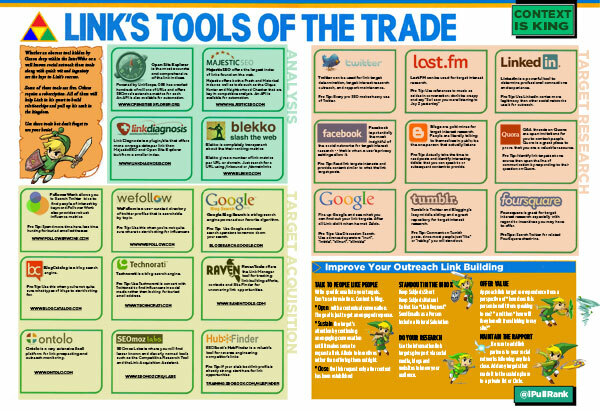 BONUS: Link tools of the trade infographic!